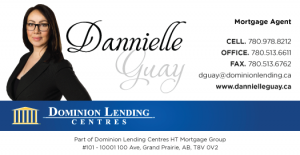 Dannielle has called Grande Prairie her home for the past 15 years. Lucky for us, she combines a strong background in marketing and sales with a lifelong passion for the Real Estate and Finance industry. Having owned multiple properties and homes since her 20’s, Dannielle has a deep understanding of how homeownership not only provides security but builds wealth. Dannielle’s goal: To help everyone achieve their homeownership dream! Give her a call today to start owning your dream.